For one night only music’s greatest legends will come together at Battersea Park Fireworks. 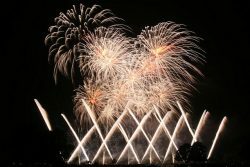 Tickets have been flying off the theoretical shelves for this year’s Battersea Park Fireworks. Those slightly late to the game have missed out on the Super Early Bird tickets, don’t panic the Early Bird rate of £8 + a small booking fee are now available and will be available until Monday 31 October. From Tuesday 1 to Saturday 5 November tickets will be £10 + a small booking fee – but hurry as tickets sold out well in advance last year. The 2016 theme is ‘Legends’, the display is set to the music of legends combined with incredible light effects. The evening will be hosted by local celebrity and resident TV and Virgin Radio presenter, Christian Williams. Bring your friends and family to watch as fireworks dance across the night’s sky to music made by legends. There will be a variety of food and drink stalls to choose from as well as the ever popular glow toys. We want to know who your musical legends are. Tweet your favourite to @WandsEventsTeam using #Fireworks to tell us who you idolize and why – perhaps they may feature in this years soundtrack! Advanced: 1 – 5 November £10.00 + booking fee. Children under 10 go free but must have a ticket. Child tickets can be booked online when an adult ticket is purchased. 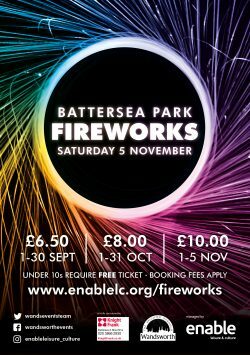 Wandsworth Council’s Battersea Park fireworks display is managed and delivered by Enable’s Events Team, proudly sponsored by Knight Frank Battersea and Nine Elms office. Time: Gates open for food drink and entertainment at 6pm. Gates close at 8pm and fireworks display begins at 8pm. Fireworks, sparklers, animals or pets or glass bottles are not permitted. Bag searches will be in place. No parking available at the event, members of the public are strongly advised to use public transport where possible.